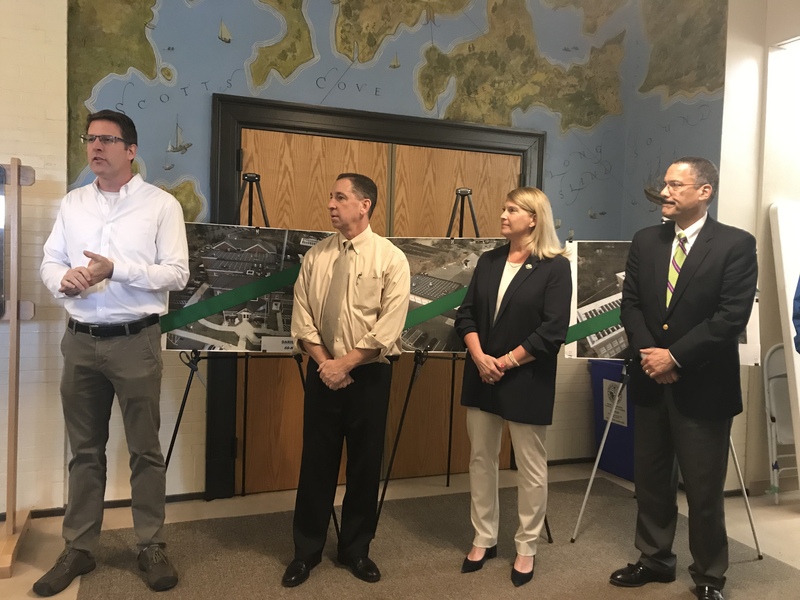 Pictured from, left to right, are Craig Flaherty, Chairman of the Advisory Committee on Sustainability, Ed Gentile, Director of Public Works, First Selectman Jayme Stevenson and Bert Hunter, Chief Investment Officer, Connecticut Green Bank. 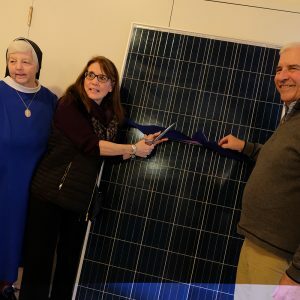 On Earth Day (Monday, April 22, 2019), the town of Darien held a ribbon cutting ceremony to recognize the installation of solar photovoltiac systems at their police station, the Department of Public Works Garage, and Town Hall. These are the first of six new solar systems on the roofs of town facilities to go online; the other sites are Tokeneke School, Holmes School, and the Board of Education Administration Building. The Connecticut Green Bank owns the systems, which were designed and constructed by Encon. 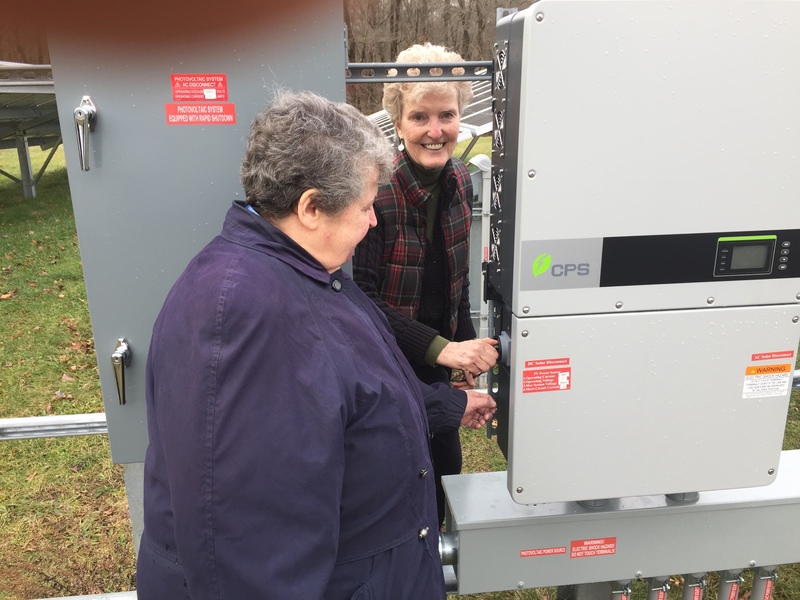 The town paid no upfront costs for the systems and will purchase power from the Connecticut Green Bank at a fixed and flat rate over the next 20 years. When all six projects are installed and producing energy, the town’s savings are projected to exceed $1 million over the 20 year contract term. Rocky Hill, CT (May 22, 2018) – The Connecticut Green Bank announces that Cross Island Provisions Inc., located at 49 Plains Road in Essex, has closed on Commercial Property Assessed Clean Energy (C-PACE) financing for the installation of an 80.6 kW solar photovoltaic (PV) system on their building. The system will help lower the energy burden on the business, with projected savings over the life of the system expected to surpass $560,000. The 5,800-sq. ft. facility is used for commercial operations related to the distribution of Boar’s Head delicatessen meats, cheeses and condiments by a group of inter-related companies owned and operated by the Piagentini family. 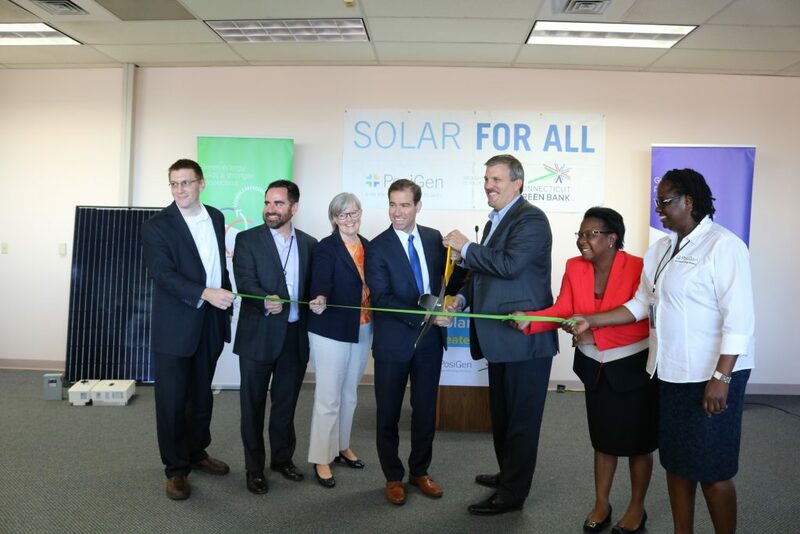 SolarUS, headquartered in Branford, installed the system, which is projected to reduce CO2e emissions by 61 tons and produce 91,130 kWh of electricity in year one. Commercial Solar Systems of Hamden is the contract holder. For more information on C-PACE, please visit cpace.com. For more information on Solar US, please visit solarusmfg.com. 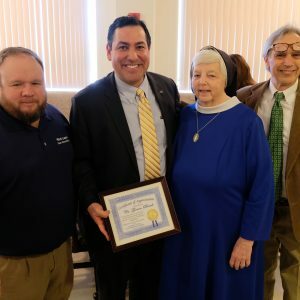 Rocky Hill, CT (May 16, 2018) — The Connecticut Green Bank was honored as a recipient of a 2018 State Leadership in Clean Energy Award for its Connecticut “Solar for All” program, a partnership with PosiGen Solar and Energy Efficiency. This was one of only six programs nationwide to win a 2018 “SLICE” Award for its outstanding accomplishments. The Clean Energy States Alliance (CESA), a nonprofit coalition of public agencies working together to advance clean energy, established these biennial awards to highlight model programs and projects that have accelerated the adoption of clean energy technologies and strengthened clean energy markets. The recipients of the awards were chosen by an independent panel of five distinguished judges, each with years of experience in clean energy. 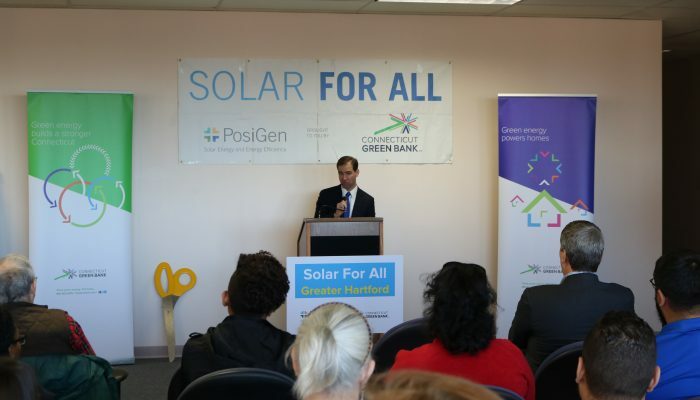 The Connecticut “Solar for All” partnership is a ground-breaking public-private effort between the Green Bank and PosiGen. 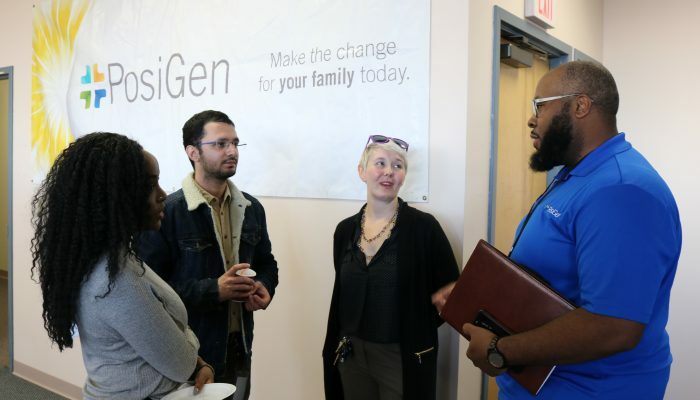 With Green Bank support, PosiGen offers a low-to-moderate income (LMI) targeted solar lease paired with energy efficiency measures for homeowners, regardless of income or traditional measures of creditworthiness. 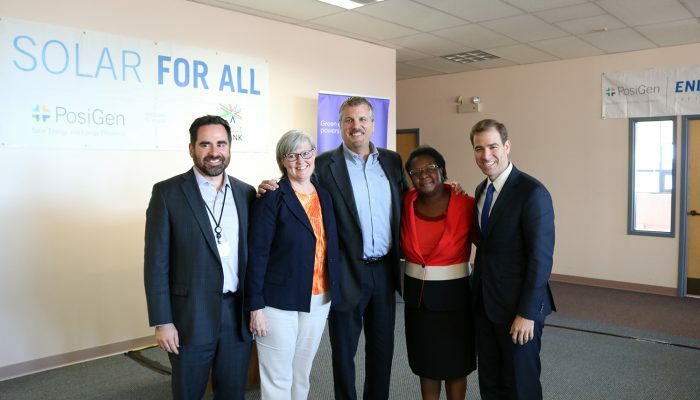 Since the partnership launched, solar penetration in Connecticut’s low-income communities has increased 188% and over 800 low-income verified households have signed up to go solar with PosiGen. CESA member organizations from across the U.S. submitted nominations for the 2018 SLICE Awards. Entries were judged based on public benefits and results, cost effectiveness, leadership and innovation, and replicability. The five judges who reviewed all the nominated programs were: Elizabeth Doris (National Renewable Energy Laboratory); Sara Fisher-Goad (former Executive Director of the Alaska Energy Authority); John Geesman (former Commissioner at the California Energy Commission); Rebecca O’Neil (Pacific Northwest National Laboratory); and Devrashree Saha (Council of State Governments). CESA is publishing a case study on the Solar For All program in June. It will be posted on CESA’s website. Additionally, CESA will host an upcoming webinar presentation on Thursday, August 2 at 1 pm EDT with guest speakers Kerry O’Neill, Vice President of Residential Programs at the Green Bank, and Beth Galante, Vice President of Business Development & Government Relations at PosiGen. For more information on this free webinar and to register, click here. For more information, please visit posigen.com. 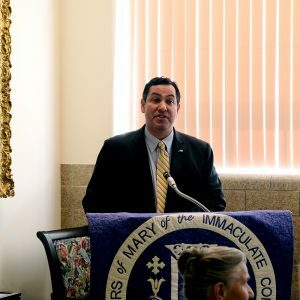 The Daughters of Mary of the Immaculate Conception have added solar arrays at their New Britain property through an investment of $2.8 million. The Daughters will benefit from $1.3 million of energy savings over the next 20 years, and this savings will help them continue to provide tremendous service to domestic abuse victims as well as affordable senior housing and day care services for children and the elderly. 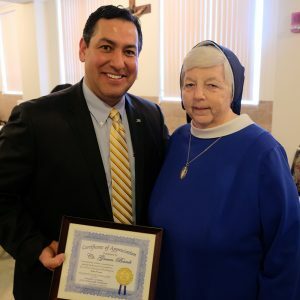 Bryan Garcia, President and CEO of the Green Bank, spoke at the ribbon cutting ceremony, and was presented a plaque by Mother Jennifer, superior general of the Daughters of Mary, for the Green Bank’s role in this project. A total of 3,668 solar panels were installed in three fields. The Green Bank, Eversource Energy and Ecosolar worked together to bring this project to completion. Panels were installed with five and seven foot screws, drilled into the ground to withstand winds over 110 MPH. Installation is projected to produce more than 1.4 million kWh’s annually. 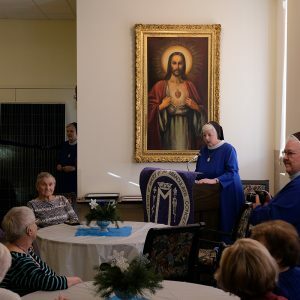 St. Lucian’s Residence, Prudence Crandall and Monsignor Bojnowski Manor went online in July 2017. Hospital for Special Care Education and Research Center and Marian Heights went online in November 2017. 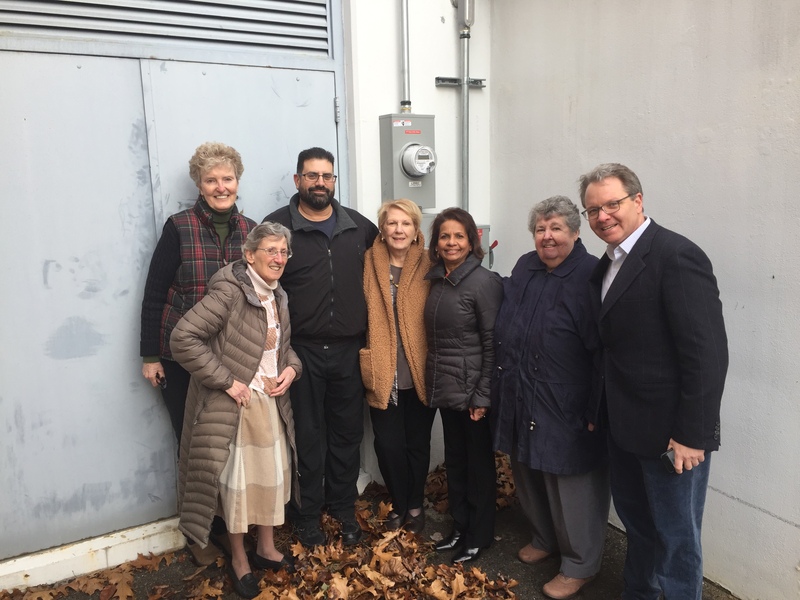 As of early January 2018, more than 275,000 kWh’s have been produced, saving more than $50,000 for the Daughters of Mary. Click here to read the story in the New Britain Herald.